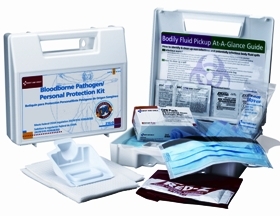 First Aid Only Bloodborne Kits consist of a variety of kits that clean up body fluids and germs. Being unprotected while cleaning up body fluids would be remiss and dangerous to yourself and to others that you may come in contact with. These kits meet with federal OSHA recommendations and protect against bio-hazardous contaminants. First Aid Only Bloodborne Kits come in a variety of sizes. They are also available in compliant packages that meet federal OSHA regulations and ANSI standards. They cover four compliance issues: first aid, bloodborne pathogen, personal protection and CPR. They are wall-mountable and durable.